Local in disturbed ground and along roadsides; not persisting. A native of the Old World cultivated since prehistoric times and first collected in Michigan in 1905 in Wayne Co.
Our plants are subsp. bicolor. 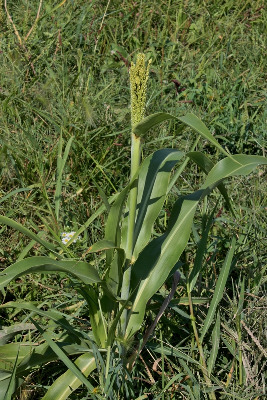 Sorghum bicolor subsp. drummondii (Steud.) 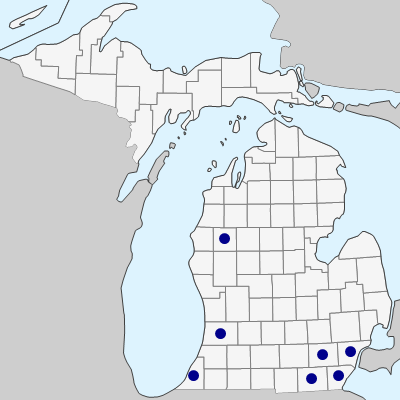 De Wet & Harlan, sometimes treated as S. sudanense (Piper) Stapf, has been collected from a cultivated field in Shiawassee Co. and apparently also in Allegan, Ingham, and Kalamazoo Cos., probably never as a true escape. It would run best in the key to S. halepense, from which it differs in annual habit and spikelets not disarticulating. Immature specimens without basal parts are not easily distinguished from S. halepense. MICHIGAN FLORA ONLINE. A. A. Reznicek, E. G. Voss, & B. S. Walters. February 2011. University of Michigan. Web. April 21, 2019. https://michiganflora.net/species.aspx?id=2223.